22 September, 2018. The Duke of York has been Colonel-in-Chief since1992 when the Regiment was established with the amalgamation of the Ulster Defence Regiment and the Royal Irish Rangers. With an antecedence reaching back to 1688, the Royal Irish Regiment was established in 1992. Since then, the Regiment was engaged in military operations in Northern Ireland, in the former Yugoslavia, Sierra Leone, Iraq, Afghanistan and Mali. The Royal Irish Regiment is the only Irish Infantry Regiment of the line in the British Army. The Regiment recruits from across the island of Ireland, all parts of the UK and beyond. The 1st Battalion is stationed in Tern Hill, Shropshire. With a strength of 550 all ranks, the battalion is currently at High Readiness as part of NATO’s Joint Expeditionary. The majority of its personnel are from Northern Ireland and serve alongside 38% of its strength who come from Ireland. The Battalion has deployed on two tours of duty on Operation Telic in Iraq and four tours in Afghanistan. Recently, the Battalion was selected to advance the evolving light mechanised infantry concept for battlefield manoeuvre. The 2nd Battalion is the Regiment’s Light Role Infantry Army Reserve Battalion, and is based in Lisburn with satellite locations in Ballymena, Belfast, Enniskillen, Newtownabbey and Portadown. 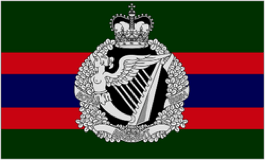 The Battalion was the last Royal Irish Rangers unit, and remains the sole Irish reserve battalion in the British Army. 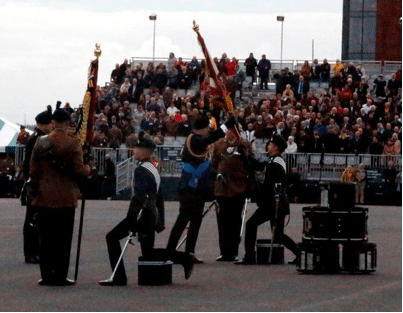 In recent years, elements of the Battalion, including Colour Parties and Pipers, have paraded with Defence Forces personnel in commemorative events in Dublin. The Colours of The Royal Irish Regiment are emblazoned with selected campaign and battle honours commemorating deeds by the Regiment’s forebears. The Queen’s Colour carries those battle honours from both the First and Second World War, and The Regimental Colour battle honours since Martinique 1762. The green field of the Regimental Colour, reflecting the Regiment’s uniform facing, also has several distinctive devices. One is a Sphinx which commemorates service in Egypt during the Napoleonic wars and the other is the Conspicuous Gallantry Cross presented personally by The Queen in 2006 as a mark of the nation’s esteem for service by the Regiment’s Home Service battalions and their forebears in The Ulster Defence Regiment. Each Colour carries the number of the battalion in the centre of the Queen’s Colour, and in the upper canton nearest the Pike in the Regimental Colour. Both Pikes are surmounted by a gold crown surmounted by a gold lion. The on the Regimental Colour is “Faugh a Ballagh”, a version of the battle cry in Irish, “Fág an Bealach”, meaning Clear the Way. The parade was under the command of Brigadier M.B. Murdoch MBE, with Lieutenant-Colonel M.G.T. Lewis OC 1st Battalion and Lieutenant-Colonel P.J. Walkley OC 2nd Battalion. The Bandmaster was WO2 (BSM) D.S. Mayes and the Parade Regimental Sergeant-Major was WO1 (RSM) C.M. Tweed. The Regimental Call and Advance was sounded by Buglers rendering the opening bars of “Killaloe” followed by the infantry Call to Advance. The Regiment’s Irish Wolfhound Brian Boru X, led the troops on parade to the music of “South Down Militia” dedicated to the personnel of the 8th Royal South Down Regiment which was the only Ulster unit to receive a battle honour for South Africa (1901-1902), and “Faugh-a-Ballagh”. The Regimental Mascot was led by Wolfhound Major Robert Moore, 1st Battalion. Brian Boru X has the pedigree kennel name Ronan of Nutstown, was born in Dublin in January 2016 and recruired into the Regiment in May 2016. Accompanied by Brigadier J.S.S. O’Sullivan (Retd), the Duke of York inspected the parade, formed up with four guards in each Battalion. The Band conducted a Slow and Quick Troop, following which the old Colours, which were presented on 29 September, 1972 were Trooped, and Marched Off Parade. The occasion marked the last time that Colours on parade had the title “The Royal Irish Rangers”. The cased new Colours were paraded to the tune of “The Minstrel Boy”. The new Colours were consecrated by The Chaplain-General to Her Majesty’s Land Forces, Belfast native, Reverend Dr David Coulter CB OStJ QHC CF, assisted by Rev Ivan Linton CF Chaplain to the 1st Battalion, and Rev Mark Donald CF, Chaplain 2nd Battalion. The Queen’s Colour and Regimental Colour were then bestowed upon each of the two Battalions by the Duke of York, and trooped through the ranks of assembled personnel. 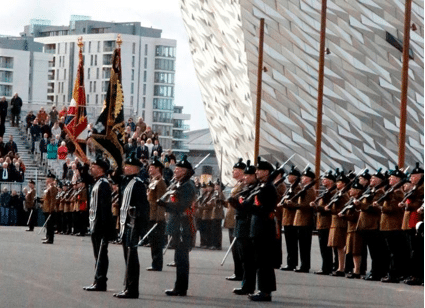 The Regiment, with its new Colours, then proceeded to March Past in Quick Time to the tunes of “The Ulster Division March”, commemorating the heroic deeds of the 36th Ulster Division during the First World War, “Musa Quala” commissioned to honour the Royal Irish Soldiers who fought in the Siege of Musa Quala in 2006, and the Regimental Quick March “Killaloe”. The tune and lyrics of “Killaloe” were written in 1887 by the Irish land owner Robert Martin. His son, Lieutenant Charles Fox Martin, serving with the Connaught Rangers composed a new set of lyrics celebrating his unit’s history and heritage. The call “Yo” rendered during the final section of the march, originates from the 1st Battalion of the Connaught Rangers, and is referred to as the “Connaught Yell”. The Parade concluded with an address by the Duke of York, the Regiment advancing in Review Order to the tune of “The British Grenadiers” dating from 1689, the Royal Salute, and the March Off. The Northern Ireland Secretary Karen Bradley, politicians including DUP MP Sir Jeffrey Donaldson and UUP MLA Doug Beattie attended the ceremony. The Military Heritage of Ireland Trust was represented by Brigadier-General Paul Pakenham (Retd). The attendance also included Trust’s Directors and members including Colonel Harvey Bicker (Retd), Mr Peter Baillie, Lieutenant-Colonel Andrew Hart (Retd) and Commandant Lar Joye. Brigadier M. B. Murdoch MBE, Deputy Colonel of the Royal Irish Regiment and Parade Commander, said the event was a “tremendous honour”. 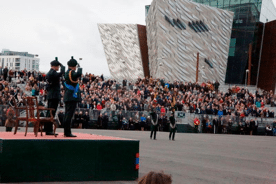 “I think it is just fantastic that the home of the Titanic is where the home of this Regiment come together, and today we are standing beside this slipway receiving our colours, in our home, the home of the Titanic, what a fantastic event,” he told the Press Association. Ranger Jamie Lennon from County Wexford said it was an “honour” to take part in the ceremony. “I’m only in the army a short time so to experience this is great as it won’t happen for another 25 years”. Unless otherwise credited, photographs courtesy of Patrick Hugh Lynch.